Self-service stations are available as hardware-only, giving you the choice to use your software or ours. 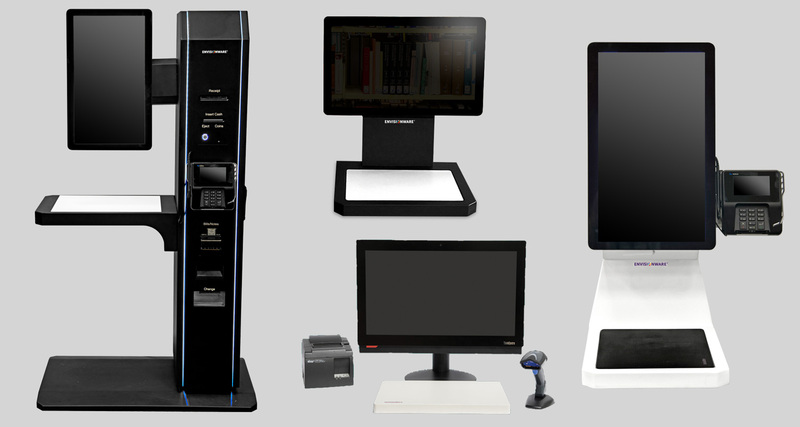 X11 Series Self-service Stations: The X11 Series is designed by EnvisionWare to deliver a broad array of choices in modern, easily serviced counter tops and kiosks. Because EnvisionWare controls manufacturing, these high quality systems are value-priced. Proline™ Component Self-service Station: This desktop solution comes with a durable, large-screen 21.5” monitor and offers a high quality, cost effective solution for self-service checkout. The self-service stations come turnkey with EnvisionWare’s OneStop™ software that supports barcode patron cards and barcode and RFID detection. The stations are also available as hardware-only for use with other self-checkout software.